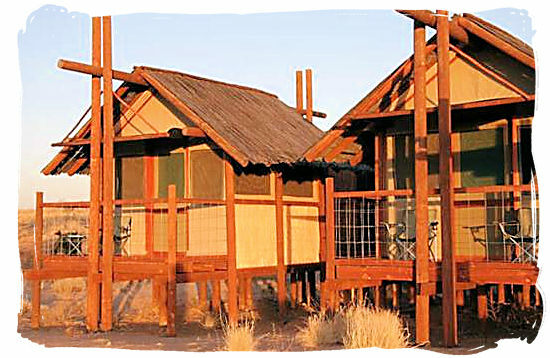 Raised above the red sand dunes of the Kalahari and suspended in time, Bitterpan wilderness camp is situated in the middle of the Kgalagadi Transfrontier Park. It can only be reached by fully 4x4 equipped vehicles via a one way only 4x4 route that runs from Nossob to Mata Mata. NB: This camp is NOT fenced and an armed Game Ranger is on duty at all times. From the Park entrance to Nossob is a 3,5 hrs drive. Continuing from Nossob to Bitterpan wilderness camp, will take at least another 3 hrs. It would be sensible to stay at Nossob for one night, before carrying on. Guests much check in at Nossob anyway. The trip from the wilderness camp to Mata Mata will also take approximately 3 hrs. A stay at this exclusive wilderness camp is a wonderful experience. It has four double bedroom cabins, each with its own bathroom and a large communal kitchen, dining room and “braai” (barbecue) area. Bedding, towelsand cooking and eating utensils are provided. There is Gas for hot water and cooking and Solar Panelling for lighting. 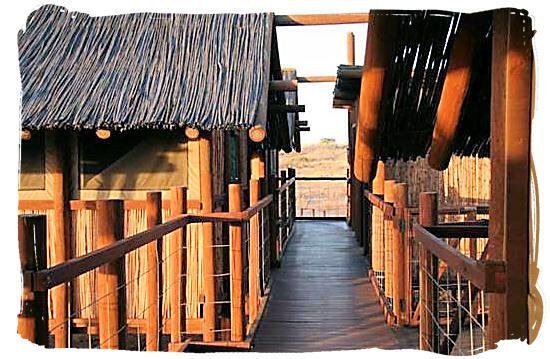 The walls of each unit are made of reeds and canvas, whereas the roof is a corrugated iron sheet, covered with reeds. Built on stilts, all units (cabins, bathrooms, kitchen) are joined by a walkway. They are very close together, not even 3 meters from each other. You literally stepped out of one and only take a step or two in to the next one. The "braai" place is in front of the kitchen. On top of the kitchen is a 6 meters high watch-tower. You have to climb a pretty steep ladder to get to the top of the tower, but the views are stunning. The camp overlooks an enormous area of what one presumes is sand and where a pan must once have been. In front of the pan is a waterhole, easily monitored from the rooms and communal area. The waterhole is very close to the camp, a distance of about 20 metres. Sometimes there are lions in the camp when they roam between the Nossob and Auob riverbeds and vice versa. There is a little loop you can drive not far from the camp. Running across the dunes between the Nossob and Auob Rivers, the road to Bitterpan is very scenic. Negotiable by 4x4 vehicles only, it is not for the faint hearted. Visitors must bring their own firewood or charcoal. Visitors must bring their own drinking water. 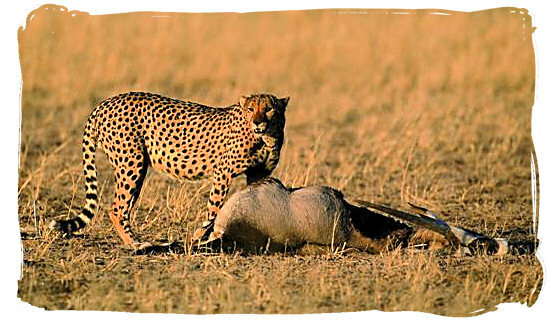 Only a one-way 15 km game drive, however visitors staying longer than one night may use the escape. route to Moravet to go onto the tourist routes and back. There is no fuel and no shop, nearest facilities are at Nossob and Mata-Mata. Go to SANParks.org to view accommodation rate and tariff details of Bitterpan rest camp on the South African National Parks (SANparks) organization’s website. 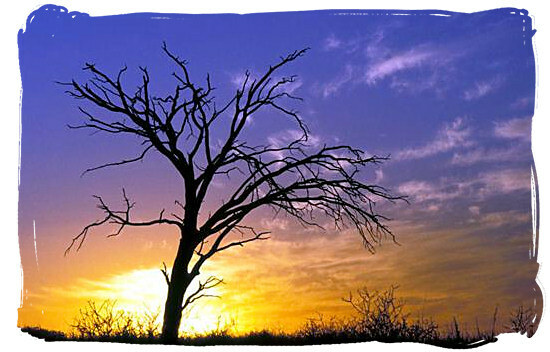 Go to SANParks.org to book your reservation for Bitterpan rest camp on the official reservations page of the South African National Parks (SANparks) organization's website.